British artist Sarah Sparkes has been working hard on a number of residencies and commissions, both Nationally and Internationally. This exhibition seeks to present these projects, alongside new works to create ‘A GHost Parlour’ for New Art Projects. Sparkes sees the objects in the exhibition as containers and conduits for the embodiment of narratives and more conceptually ‘spirits’. Her subjects include: Janet the Enfield poltergeist girl, Native Americans Ghost-dancers, Neolithic monuments and artefacts and some key figures from early 20th century psychical research; all attempt(ed) to communicate with the dead. Central to this project is ‘The GHost Tunnel’ installation, 2016-17, This major installation has toured to FACT and the National Taiwan Museum of Fine Art and is presented here in all its mystery in London for the first time. 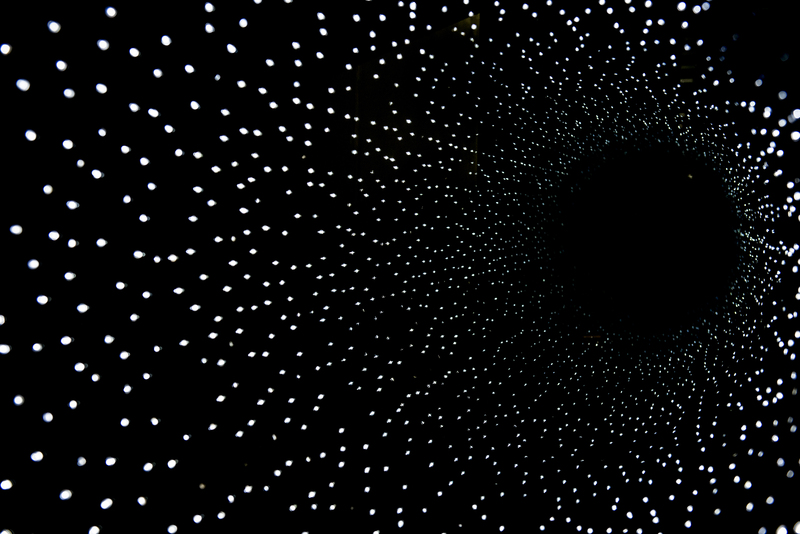 The GHost Tunnel references portals, black holes and equates time travel with death as another dimension that we may enter. Sarah Sparkes was recipient of the MERU ART SCIENCE AWARD and has entered GAMeC’s permanent collection and entered the archives of the Fondazione Meru and the Association Bergamo Scienza with her specially commissioned film ‘Time You Need’ 2015. To compliment these extraordinary pieces Sparkes has created a series of new works ‘GHost -dance – David Soul’. Two rolls of wallpaper, remnants of those that graced the walls of Sparkes’ childhood bedroom and kitchen, have been used together with gouache paint, digital print collage and assemblages to make a series of intriguing works that cross the wall like shadows of the past. Sarah Sparkes is a London based artist and curator who exhibits widely in the UK and internationally. Her work ‘The GHost Formula’, 2016, commissioned by FACT (Foundation for Art and Creative Technology) recently toured to NTMoFA (National Taiwan Museum ofFine Arts) as part of the exhibition ‘No Such Thing As Gravity’ curated by Rob la Frenais. She was the 2015 recipient of the MERU ART*SCIENCE award with her film ‘Time You Need’ which has entered the collections of GAMeC Galleria d’Arte Moderna e Contemporanea di Bergamo). In collaboration with Ian Thompson, she was awarded a funded BEYOND artist residency at Allenheads Contemporary Arts, Northumberland 2018. She exhibits with New Art Projects London. Sparkes’ work explores magical or mythical narratives, vernacular belief systems and the visualisation of anomalous phenomena. Her work is often research led and an exploration into the borderlands where science and magic intersect. She works with installation, sculpture, painting, performance and more recently film. She leads the visual arts and creative research project GHost, initiated 2008, consists of an on-going programme of exhibitions, performances and interdisciplinary seminars interrogating the idea of the ghost. GHost events have been supported by Folkestone Biennial, University of the Arts, University of London, FACT, NTMoFA and Arts Council of England – in 2016/17 Sparkes was awarded Arts Council funding for her project to archive Liverpool ghost stories. She recently co-curated ‘the Ghost Tide’ exhibition at Thames-side Studios Gallery with Monika Bobinska of CANAL Prjects. Sparkes has published chapters on the GHost project and has lectured extensively on this subject.